It used to take me 20 minutes to get ready to go to Starbucks to work. Pack computer, go to the bathroom, put on real clothes, pack snack, pack water, drink some water, assemble every gadget I could possibly need, go pee again, look for keys, time to go. Today, Steve got home at 3 PM, I threw my computer into the nearest tote with whatever key items were nearby and a half empty water bottle, and jumped into the car with a full bladder. When I got to Starbucks, I was legitimately tempted to just sit in my warm heated seat in the car and scroll through Instagram for an hour. Lord knows I’m sooooo behind on social media. Is this what motherhood feels like? After a week full-time with our new furry boy, I’d like to issue a formal apology to any mother I ever silently or subconsciously judged for not having time to cook. It’s just a baby. Aren’t they sleeping most of the time? People, can I be honest? Of course I can (I already have), it’s my blog.This is not what I thought it would be, and it’s causing me to talk about myself in the third person and not care that I haven’t swept the kitchen floor in five days. Clarence is having a few behavioral issues, and as overwhelming as they seem, I think the true reason for my distress is shifting from a life in which Steve and I were responsible for our happiness and only our happiness, to one in which the things that nurture my sanity and happiness are drastically reduced or eliminated. Or, as it feels, ripped from my prying death grip. I’ve wasted zero time on the couch or lounging around, and yet I’ve barely had a minute to tend to my real baby, Natural Comfort Kitchen, in the new year. I didn’t think this change would come until human babies arrived. Sometimes with the blog, I feel like I’m in the food blog rat race, trying to crank out the next viral post three times a week. I question my authenticity. 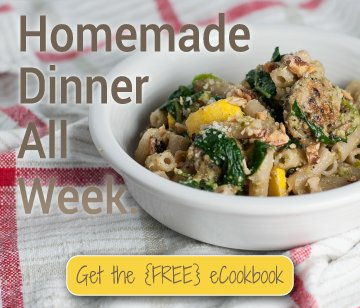 Are these the recipes I would cook and share if there was no internet? Have I sold out in search of more social media followers or my hope of someday writing a cookbook? It’s such a relief to find out, after having the blog wrestled out of my reach for going on a week by a crazed pug mix, that this pursuit is me to the core. How do I know? However selfishly, happiness and fulfillment are hard to come by without a creative outlet, public or private. I’m so desperate for that artistry and expression, I’m sitting here in the back corner of Starbucks on a Friday night, with the high school kids and realtors, not complaining about the loud toddlers and crappy table, but feverishly writing this post without a recipe to go with it. I just need to write, but I also know what the recipe will be, even before I’ve recorded it in words or pictures. It’s hard to get a bite in with bi-hourly potty breaks, vet visits, obedience training, , indoor poop cleanup, 12 page questionnaires for private obedience lessons, lint rolling, laundry, and pug hair EVERYWHERE. I eat, of course, or else I would be a hangry mess, but often it’s a scant bowl of lukewarm leftover soup…three nights in a row. 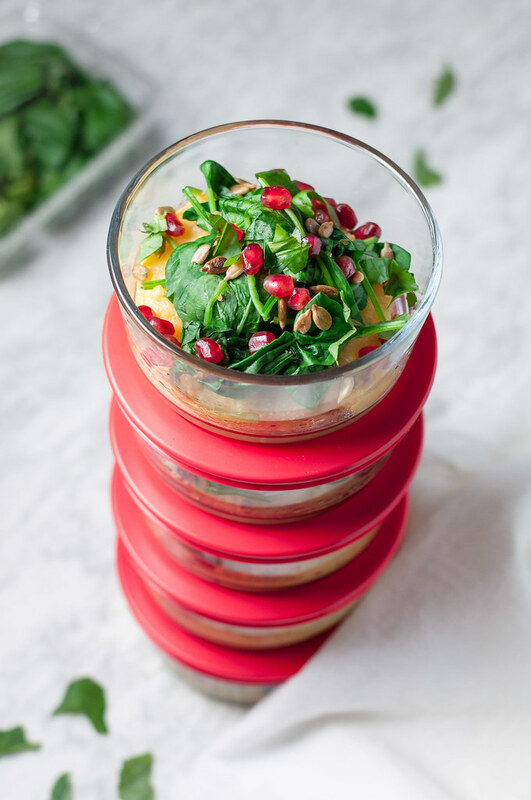 I’ve always struggled with breakfast (I prefer savory to sweet), but this week, it’s become my most creative and anticipated meal, which this one-dish pomegranate and polenta breakfast bowl so colorfully displays. And guess what. It’s delicious, too. 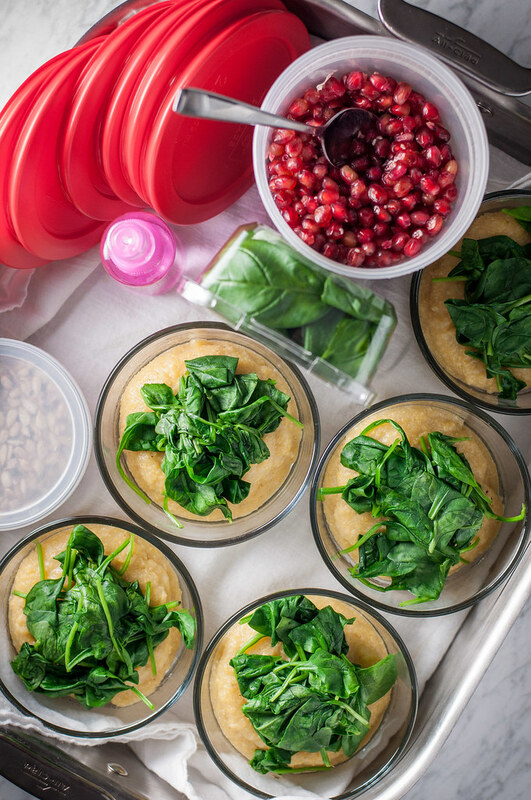 In the spirit of the responses I’ve been getting to this post already (note: I need your help), it holds up like a champ when prepped for the whole week, and it’s just so unexpected for breakfast. 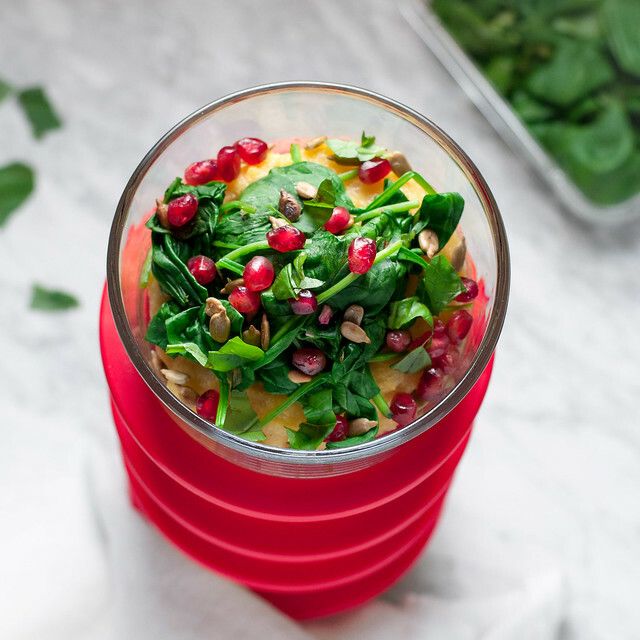 It’s decidedly Italian influenced, and while it will keep you full for hours as it has me, it makes you feel light and healthy, exactly the things you deserve from a breakfast bowl in the winter months. So how did such a colorful, clean breakfast come from a week of chaos? Here’s how: I somehow found 45 minutes to constantly stir polenta for dinner one night while Steve poured me a glass of wine and relieved me of puppy duties. In pre-puppy life, I would have made just enough for dinner, but I know better now. Double batch for sure, because when will I have another 45 minutes to stand in dedication over the stove? I had run out of brown rice (from sharing the puppy stash) for breakfast, so the next day, I nuked a bowl of polenta. But with a polenta full of rich olive oil, oily sautéed spinach was out of the question. Too heavy. I whipped out my much-neglected steamer basket and got that spinach going stat while I fed Mr. Clarence. 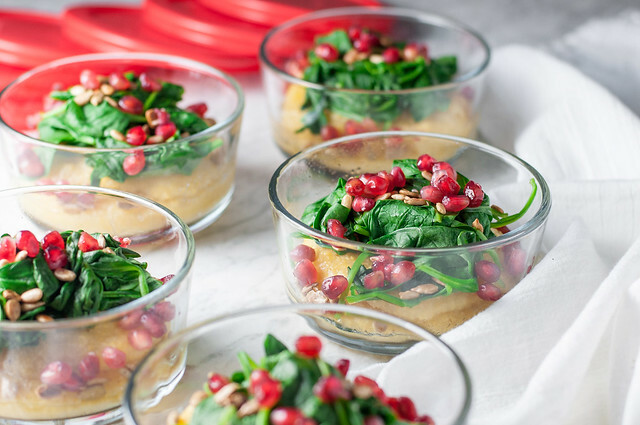 Polenta and spinach seemed kind of boring and also kind of salty, so I added the leftover tablespoon of toasted pine nuts from the previous night’s dinner, and, what the hell, a handful of pomegranate arils. I’m not shy about my disgust with fruit in otherwise savory dishes, so the pomegranate is a big move for me. As big as my recent tendency of adding dried fruit to hearty salads. Who am I even? 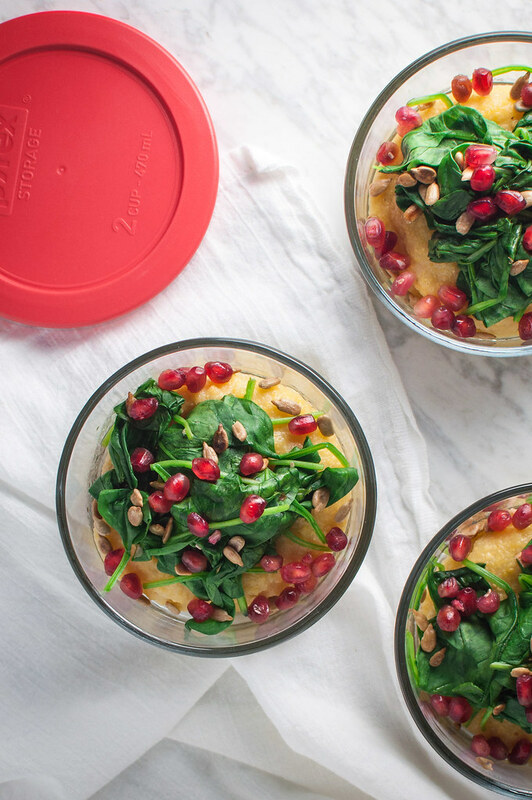 I don’t really care, because, if you can find some decent and reasonably priced pomegranates–and they’re disappearing quickly–those few seeds add essential fruit and a literal burst of sweet and sour juiciness to a comforting, savory breakfast bowl. A breakfast bowl that, even if scarfed cold at lightning speed, will carry you through a level of crazy day that you never knew existed. To polenta newcomers: Welcome. To warn you, your creamy polenta will firm up as it sits in the fridge, no matter how smooth you make it. Embrace your overnight polenta cake. Heat it and eat it: there’s not much that tastes better in the morning. 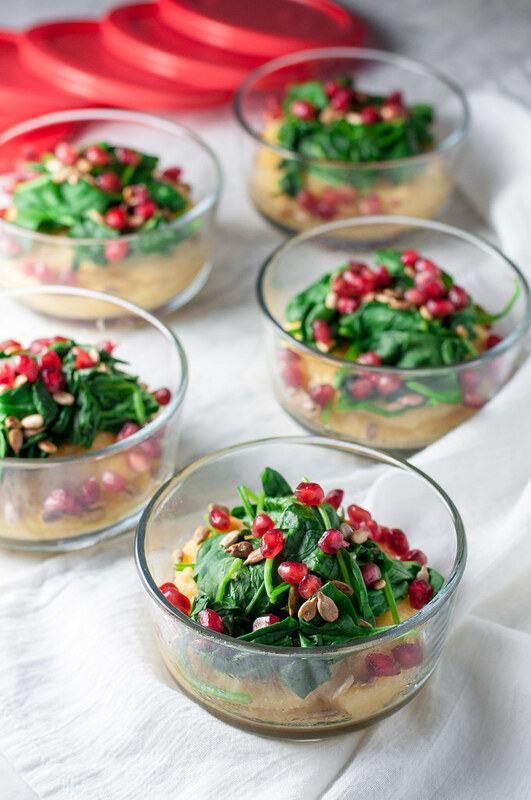 A wintry breakfast bowl that breaks from oats and quinoa and all those traditional grains. Start your day with a rainbow of color to wake you up and sustain you at least to lunch. Make the polenta. For traditional polenta (follow package instructions for quick cooking polenta), bring stock or water to a boil in a medium saucepan. Slowly pour in dry polenta as you stir. Let it come back to a boil about 15 to 30 seconds, then reduce heat to medium low, or until the polenta is barely bubbling. Stir almost constantly until polenta is soft to the bite and thickened, but pourable, about 45 minutes. Stir in olive oil, 1¼ teaspoons salt, and black pepper to taste. Distribute amongst five resealable, microwavable containers. Add enough water to a saucepan (the same one you used for the polenta, cleaned, to save dishes) that the steamer basket sits just above it. Bring water, with empty steamer basket, to a boil over medium high. Add spinach, cover, reduce heat to just below medium, and steam for 6 to 8 minutes, until beginning to wilt. Turn off heat and uncover spinach after another minute. Use tongs to distribute amongst the five containers, then sprinkle each with salt and pepper to season spinach. Each day, reheat bowls in the microwave at power level 7 or 8 until warm as desired. Top with pine nuts and pomegranate arils, which are best stored in separate containers until serving. If you don't have a steamer basket and don't want to buy one, you can blanch (briefly boil) the spinach. Drain well, pressing out the water, so it doesn't make your bowl watery as it sits in the fridge all week. The recipe is vegan, gluten free, egg free, and can easily be made nut free. For a nut free substitution, top bowls with toasted sunflower or pumpkin seeds. Using traditional polenta, I ended up with about ¾ cup cooked polenta per bowl. 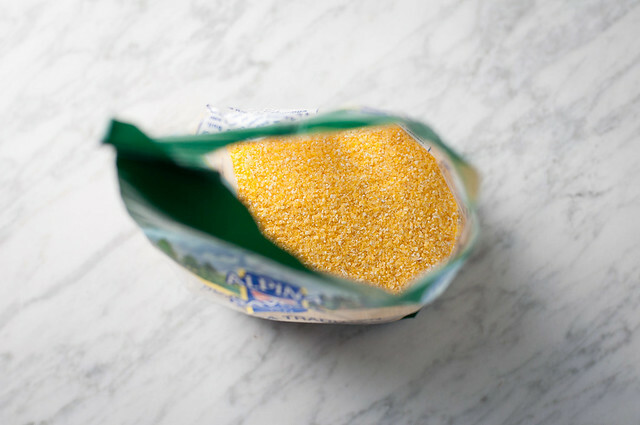 Check the package if using instant polenta, to make sure you'll have enough cooked polenta for all five bowls. I’ve never commented on your site before but I’ve been following you for a couple months now and love your recipes! But when I read your post today, I had to comment. Oh, puppies. How wonderful, and how utterly exhausting. We adopted 3-month-old German Shepherd sisters almost 6 years ago. Those first 2-3 months were brutal. As a disclaimer, I don’t have human children, so I don’t have anything to compare it to. But it was also amazing to me that it’s like everyone forgets how hard the puppy stage is. The getting up at night, letting them out constantly, and having to watch them like a hawk at every moment. Man, it was tough. About a month after we brought home our girls, we took in a foster dog as well. She was 8 years old, but not house-trained and had been pretty badly abused, so she had some behavior issues. We were house-training 3 dogs all at the same time and I thought I would lose my mind. I remember telling my husband, I am just so sick of bodily fluids. Of any kind. So. Tired. So all of that to say, it’s so hard and hang in there and it gets much better! Caroline–thanks so much for commenting. So happy to hear you like the recipes here :) THANK YOU for the puppy encouragement. It is such a roller coaster. There will be future updates, so feel free to chime in anytime!